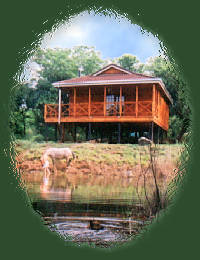 We are a private guest "farm" situated in Skeerpoort, which is to the west of the Hartbeespoort Dam. The Magalies River runs through the bottom section of our 51-acre property and we look out on the magnificent Magaliesburg Mountains. We have a swimming pool and tennis court for the energetic, but the emphasis is on relaxing and getting away from the bright lights of the city. Our area has picturesque places to walk, bicycle or horse ride and has an abundance of birdlife. 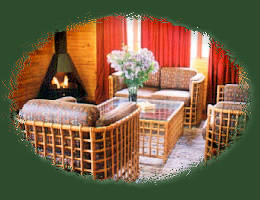 Is a 2 bedroomed cottage, which sleeps a maximum of 6 guests. The main bedroom has a double bed, the second bedroom has 2 single beds and there is a double bed sleeper couch in the lounge/dining area which can sleep 2. It has a fireplace in the lounge, a bathroom (with bath) and a kitchen with microwave, fridge, 4-plate gas stove, crockery, etc. The cottage has a large outdoor patio area and a stone built braai. It can be booked for 2 - 6 guests as required. 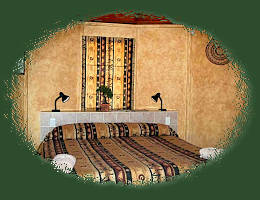 Is a 2 bedroomed cottage, which sleeps a total of 4 guests. The main bedroom has a double bed, the second bedroom has 2 single beds. It has a bathroom (with shower), lounge with fireplace, small kitchen with microwave and 4-plate Defy hob, cutlery, etc. The wooden deck on the cottage overlooking the farm dam has a Weber braai. It can be booked for 1-4 guests as required. The four new cottages consist of a main bedroom with fireplace, a large bathroom en-suite, plus a private patio and braai area. Each has a TV (including 5 DSTV channels), fridge, toaster, kettle, microwave, with basic cutlery and crockery supplied. A satellite kitchen equipped with microwave, stove and washing-up area is available 30m from each rondawel. Guests are welcome to bring their own skottles etc. for use outdoors. Breakfast can be provided upon request, should guests not wish to cater for themselves. There are also several restaurants in very close proximity. We offer specials for midweek breakaways, long stays, groups and large parties . . .